Santa Fe! – Art's Musings, etc. As I described in a previous post, in August 1981 Katherine and I arrived in Santa Fe, New Mexico, found an inexpensive apartment on Guadalupe Street, unloaded our few belongings, and hugged my Mom and her husband Jay goodbye. One of our belongings was Katherine’s cat, Bogart. Bogart hated me from the first moment that he saw me in SLC at Katherine’s apartment. I suppose he was jealous. Among many other ways of expressing his jealousy was urinating and defecating on my belongings. This started in SLC and escalated in Santa Fe. One night he urinated on top of me, while I was sleeping in bed with his dear Katherine! Bogart notwithstanding, Katherine and I were entering a new and exciting life together. We were “official” now: living together and responsible for shopping, cooking, paying bills, etc. As I mentioned before, we moved to Santa Fe so that I could return to St. John’s College for my second year of school, having already taken off a year after high school and a second year after my first year of college. However, I also needed a job, and before I spent much time on campus or reading the great books, I found the Square Deal Shoe Shop on Burro Alley, near the Santa Fe plaza. Recall that at this point, I had more experience repairing shoes at Tip Top than almost anything else, so finding a job as a shoe repairman seemed like a natural fit. 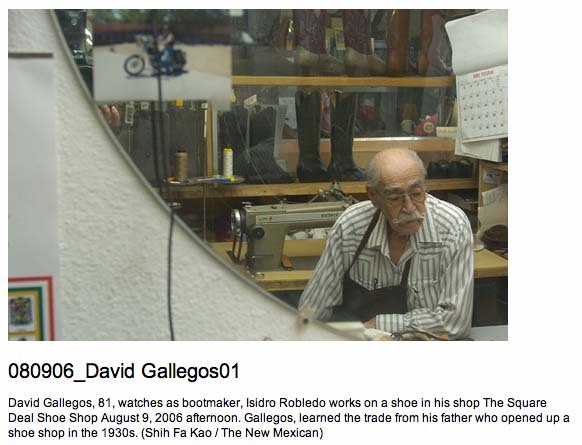 Dave Gallegos was the owner of the Square Deal Shoe Shop. He was outgoing and friendly, had a huge waxed handlebar mustache and the messiest shop I had ever seen in my life. Picture Salvadore Dalí in cowboy boots and a western button up shirt. There were literally mounds of shoes, purses, boots, and jackets everywhere in the shop. Dave also was a master bootmaker, and he had several boots in various stages of completion strewn around as well. Using the wonders of the web, I managed to find this picture of Dave (about 30 years older, smaller mustache, but looking great!). His new shop is muchbetter organized than I ever saw it while it was on Burro Alley!